It's time again for another month of madness with the Lipstick Chicks!!!! My DT term has come to an end so sadly this will be my last reveal with them.......wahhhhhhhhhhh!!!!! I must say tho I have had a great time, met some wonderfully talented scrappers and made some great friends! What more could a girl ask for? I need a tissue......sniff, sniff. So, have you played with us before? It is super duper easy!!! Can ya scraplift? Well, there ya go!! If you can scraplift you can win this thing!!! Each month at XOXO each of the Lisptick Chicks creates a masterpiece of scraptastical proportions! (like that one??? I just made that word up myself.....feel free to borrow it......lol) They get posted for all of you to "oooohhhhh and aaaaahhhhhhh" over and I just know that out of all of those layouts you will see something you totally love and want to copy and put your own twist on it. And the bestest part of this whole challenge/constest is you can scraplift as many layouts as you want and enter as many times as you scraplift! Cool, huh? Obviously, the more pages you do, the better your chances of winning are. Now didn't I tell ya this was gonna be easy??? So before you run on over to XOXO and pick you something here is what I created........Are you in the mood for Christmas yet? Ohmygosh!!! I was at Hobby Lobby today and they have Christmas stuff on display!!! WHAT????? Now, from a crafters stand point I totally get putting out seasonal CRAFTING supplies. 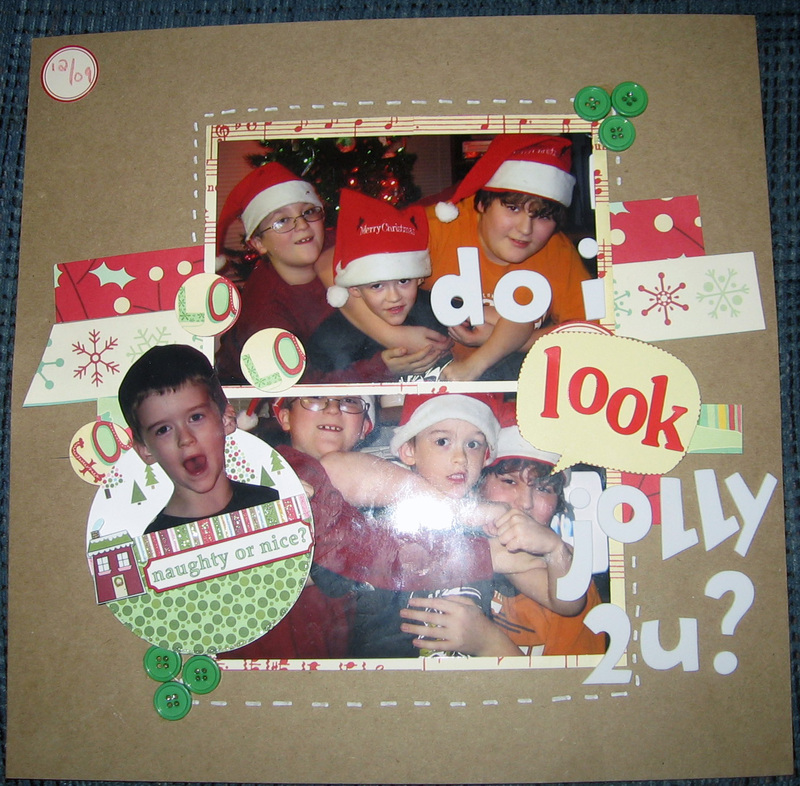 Many of us could start right now and still not be done with our Christmas crafting or card making. But I think putting out the trees and ornaments and such is just a little bit of overkill. It's not easy to feel all Holly and Jolly and stuff when its 90 flipping degrees outside........lol. My chestnuts are already roasting....no need for the fire!!! See how easy it is for me to get off track......lol. This page features 3 of my kiddos. Biggest to smallest.......Steven (13) Brandon (10) and Jesse (5). This was last year at Christmastime. Don't they all just look so happy?? LOL. That is why I titled my page......."Do I Look Jolly To You?" Every photo op is just another opportunity to beat up your brother......it's an unwritten rule somewhere. I used a kraft cardstock base for this one.......because kraft is my absolutely FAVE thing to work with and nothing sets off Christmas papers like kraft IMHO! Most of the Christmas papers are from Cosmo Cricket's (LOVE THEM!!!!) Holly Jolly line. I also used American Crafts thickers, American Crafts white gel pen for my fake stitching, buttons are from my stash, the little albel at the top is from Jenni Bowlin, and I have no clue as to the orgin of the products used to make the little ornament pocket that Jesse's cut out head is resting in......lol. It is actually a gift card holder that I won in a blog hop.....I just thought it was darling and finally decided I wanted to use it rather than give it away......lol. Thanks for looking! Head on over and pick a LO or 2 to lift this month....this is the last reveal for several of us so send us out with a bang!!! Such a cute layout Tina! Christmas stuff already?! Now that's just crazy. I'm not even ready for school to start,lol!!! !